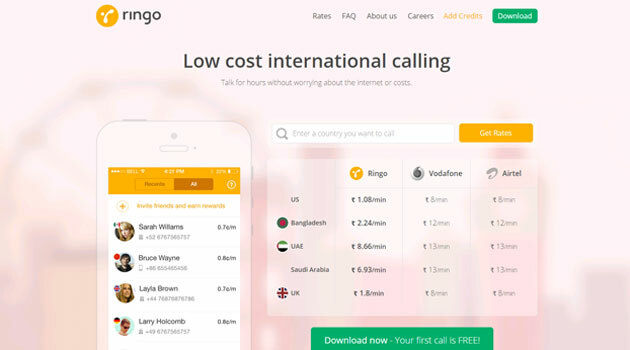 Bhavin Turakhia, founder and CEO of Directi Group, a part of which was acquired by US-based Endurance International Group last year, has launched an international calling app, Ringo that functions without internet connection. Run by Riva FZC, a startup Turakhia founded last year, Ringo is the second entity launched by him under this umbrella. He launched a professional chat app called Flock last year. Ringo works on the voice network of telecom operators instead of the data connection offered by them unlike most other chat apps. It charges customers as per the duration of calls made and pulls in as low as Rs 1.08 for a one minute call to the US. On an average operators like Airtel and Vodafone charge users Rs 8 per minute for calls made to the US. It also seeks to undercut competitors like Skype and Viber who charge Rs 1.45 and Rs 1.20 a minute for calls to the US. The payment is made through a pre-paid mode for the app which loads credits on the account. As per its business model, Ringo shares 73-97 per cent of its revenue with the telecom operators for using their voice network. It is available on iOS, Android and Windows devices. Ringo has already been functioning in select geographies in Beta in the UK and the US and has over 0.17 million registered users across the globe generating 40-50 million minutes of calls on an annualised basis. One limitation of the product is that users cannot avail this service while on international roaming or for multiple mobile numbers. This is because currently the user's Ringo account is linked to a single local mobile number. To deal with this, the company plans to introduce multiple number account in three months. Users can then buy new SIM cards in the country they travel to and log in to the platform using the credit to their single account with multiple phone numbers. Turakhia is also working to bring this platform on feature phones. Talking to Techcircle.in, Turakhia said the move comes after he decided to disband the previous product Talk.to. This was an app which provided users chat, messages and calling options. "Talk.to has been disbanded into these two products. In fact Talk.to was meant to be one product that did voice as well as messaging. We have broken it down to Flock and Ringo and there are bunch of other products that are now coming in down the pipeline," he said. "Breaking up the product is a good strategy. Facebook is breaking up its properties into different products, Twitter, LinkedIn and Four Square have done the same thing. It is kind of the standard now. You want to get a focused audience that gets real good utility from your app, it does one thing but does that one thing really well," according to Turakhia. The company also plans to launch few more apps however Turakhia declined to divulge further details. Riva currently has around 100 employees globally including in places like Dubai and Singapore besides India. "We are hiring people for the US and UK markets as well, as of now one for each market," said Turakhia. Directi developed mass-market web products with more than 25 offerings. The combined product portfolio of various Directi businesses included communication and collaboration apps, social networking software, instant messaging, context analysis engines, anti-spam and anti-virus solutions, large-scale billing and provisioning platforms, traffic monetisation solutions, online ad solutions and web hosting control panels. US-based Endurance International Group Inc, a provider of cloud-based SMB solutions, had struck a deal to buy Mumbai-based Directi Web Technology Pvt Ltd among other group entities for $110 million. This represented Directi group selling a part of its global business. Endurance completed the acquisition of the web presence business of Directi and as part of the deal, it picked ResellerClub, LogicBoxes, WebHosting.Info, as well as BigRock, early last year. Post the acquisition, the business units that have been retained by Directi group include .PW (professional web) registry; online advertising solutions for publishers Media.net, Skenzo and Domainadvertising.com; ongoing coding contest CodeChef; Radix FZC, a top-level domain name registry business besides Riva. In the same space, last week Kavin Bharti Mittal-led chat app Hike acquired US-based Zip Phone, a company that offers free voice-calling service for an undisclosed amount.